Infants in families who participated in an intensive new parent home visiting program involving both nurses and lay educators used significantly less medical services during the first year of life, according to a new RAND Corporation study. The families that received the services were one-third less likely to visit the emergency room in their child's first year and made fewer visits to primary care doctors as compared to peers who did not receive the services. The findings are published online by the journal Pediatrics. The study involved 244 first-time parents and their infants in New Mexico who were randomly assigned to either a control group that received no additional help or were enrolled in a program that combines health care workers and lay parent educators who visit new parents frequently over their child's first year. The goal of the program is to increase the health and well-being of families parenting for the first time. Some of the widely-implemented infant home visiting programs are staffed exclusively by nurses, but researchers say that staffing approach may be difficult to use in many locations because of nursing shortages and the relative high expense of using nurses only. The United States is experiencing the largest expansion of home visiting for newborns in its history. The federal Affordable Care Act included $1.5 billion in funding for home visiting programs and many states also have made substantial investments in such efforts in recent years. Kilburn and study co-author Jill S. Cannon evaluated the First Born® Program that was created in New Mexico, a state with nursing shortages and child outcomes that are among the worst in the nation. The First Born visitor teams include a registered nurse or other licensed health care professional who provides a postpartum home visit, delivers the medical components of the program and continues to participate in the home visits when families encounter medical challenges. The second member of the home visitor team is a parent educator who delivers the nonmedical parts of the program after receiving extensive training. The program is designed to promote children's health and developmental outcomes and improve parenting in areas such as breastfeeding, ensuring child safety, providing appropriate health care for the infant, promoting child development, developing nurturing relationships and accessing needed community resources. 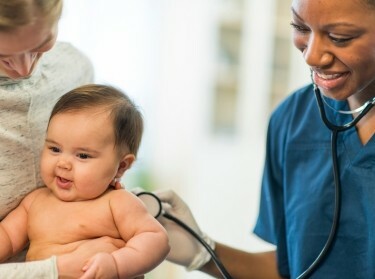 The RAND study found that children who participated in the First Born Program were 41 percent less likely to see a primary care doctor nine or more times in their first year; the American Academy of Pediatrics recommends seven well-child visits between the time a child is evaluated as a newborn and one year of age. Home-visiting programs usually target mothers who demonstrate some risk factor, such as being an adolescent or having a low-income. However, the RAND study also found that children benefitted from the program even when their parents were not considered at-risk. Research for the study was supported by grants from the Brindle Foundation, Con Alma Health Foundation, Delle Foundation, W.K. Kellogg Foundation, McCune Charitable Foundation, Pew Charitable Trusts, the Smith Richardson Foundation, and the Thornburg Foundation.